What do the terms cubing, exterior master jig and body-in-black mean? Insights into the production process at Porsche. Along with technology, performance, sound and manufacturing as well as long-term quality, there are also design, haptics, sophistication and a love for details. Vehicle development creates the foundation for this. It is implemented in production. Contact with the Customer Centre and service centre quality are also part of the quality process. The result of the perfectly tuned interplay is a product that is top level right from the start, as most recently embodied in the 718 Boxster and 718 Cayman. “Every Porsche is proof of our comprehensive quality standard – not only within Production or Development, but across all of the companies departments,” says Albrecht Reimold, Executive Board Member for Production and Logistics at Porsche AG. “All of our employees are working skilfully each and every day to deliver the very special Porsche quality to our customers. This quality accompanies each vehicle we produce throughout its life phases.” In many cases, this life is very long. More than two-thirds of all Porsche’s ever built are still driving today. That too is a typical trait of Porsche quality. Emotional quality is defined from a multi-layer combination of design, performance and sound. It has always been a very significant character trait for a Porsche, and to customers it is a key criterion for purchase. Functional quality must primarily fulfil the expectation that a vehicle will always operate perfectly. It consists of the factors reliability, quality of use and everyday practicality. Key words such as haptics, sophistication, seam appearance and love for details explain image quality. It is the impeccable and visually flawless appearance that in sum makes a Porsche perfect. The excellent Porsche quality is rounded out by excellent service quality in interaction with customers. The continual challenge is to boost quality with each new vehicle model. Moser: The challenge is not only to maintain our high quality level despite new technologies and the significantly growing complexity of our products, but to further boost quality with each new vehicle. There are various key indicators for measuring quality and thus making it transparent, such as by generating precise statistics on claims and warranty costs. There are also statistics for long-term quality. One example is the TÜV Report for 2016. In this report, the Porsche 911 was ranked at the top with the fewest defects in three vehicle age categories: up to seven, up to nine and up to eleven years. In addition, for years now it is the unrivalled series winner in the international quality ranking of J.D. Power. Albrecht Reimold: “To constantly work in these peak regions also reflects our understanding of sports car manufacturing in terms of quality. Every athlete measures his or her performance in competition by measurement values and key indicators – and that is precisely how Porsche builds its sports cars as well. Every employee in production is aware of this challenge, whether in their work preparation, on the assembly line or of course at our quality and analysis centres. It is a joy and an incentive at the same time to take up this challenge anew on a daily basis." The quality and analysis centres and final audit areas at the Zuffenhausen and Leipzig plants are key components of the overall quality process at Porsche. They enable production experts to conduct a detailed failure cause analysis for different parts. The quality and analysis centres are important starting points, especially in the production start-up of new vehicles. This is where the quality of the car’s image is meticulously optimised right from the start. The goal is to have series production run with maximum perfection right from the start. In addition, the experts are sought-after contact persons up until a model is retired, and they are always engaged when important quality issues need to be resolved. “At Porsche, quality is the result of intensive work that is driven by a love for the perfect sports car in all of its phases and aspects. When it comes to quality topics, we study every little detail to its roots – that is what distinguishes Porsche,” says Albrecht Reimold. Three innovative methods that illustrate the meticulous quality work are cubing, the exterior master jig and the body-in-black. Cubing involves milling a full size car body from solid aluminium. During the production start-up of a model, it serves as a reference for optimising and qualifying assembly parts and in functional analysis of add-on parts. It can be used for such purposes as checking a leather-upholstered cockpit fitted in the in-house leather shop or checking components such as headlights for precise fit, seam quality, visual quality and appearance. Deviations can be found even down to tenths of a millimetre. The exterior master jig is used together with highly precise measuring instruments for functional analysis of sheet metal and add-on parts. The focus here is to attain precision of the overall body. This means that one area of analysis here is how different parts fit together, even though each part might conform to its own dimensional tolerances. Examined here are such features as height contours and seams – also at tenths of millimetre precision. The body-in-black enables exact assessment of the exterior skin of the body and its surface. It is built up with the most recent up-to-date interior and exterior skin parts that are relevant to the surface, and it mercilessly reveals every deviation from the specified and desired manufacturing quality, especially in pilot production series leading to the production launch. For Porsche, the future has long begun. The challenge is to perfectly integrate new technologies into the vehicle – such as digitalisation, smart mobility and electric mobility – and to simultaneously further enhance product quality. 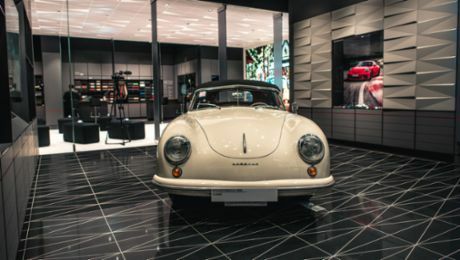 Here, Porsche is not simply performing integration work – rather the company looks at how it can make every detail better to fit the brand and its products perfectly. This also applies to apps, Internet services and connectivity. “It isn’t just a matter of showing colourful pictures on a display. Here, we need to assure high concept quality and rethink quality,” says Frank Moser. Mission: to analyse the causes of failures and to qualify parts from pilot production to end-of-product. Preventive analyses for early quality optimisation. Cubing: pilot series qualification of add-on parts for exterior and interior. Exterior master jig: pilot series qualification of body parts with regard to fit, seams and transitions as well as matching of body and assembly parts. Seam master jig: pilot series qualification of structurally relevant body parts for fit and joinability. Total vehicle analysis with mobile and stationary measuring instruments. Body-in-black: pilot series qualification of sheet metal parts. All vehicle parts installed at the Zuffenhausen and Leipzig production sites are qualified and analysed using the instruments and methods mentioned above. 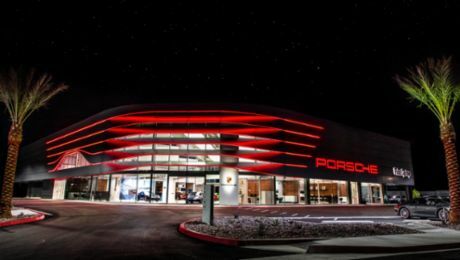 Porsche is launching a new corporate architecture for its Porsche Centres worldwide.